One undeniable truth about being a food writer is the obsessive motivation to constantly think about recipes, ingredients and how to combine them to create something worth sharing. Testing and experiment is second nature to us, and although we all have more kitchen disasters than we care to admit, those moments when a new recipe works and we come up trumps are undoubtably worth the effort and frustration. When I test new bread recipes I get giddy with anticipation. I spend days conjuring up images of what I’d love the finished product to look like and I work backwards to create a formula to make the magic happen. For those of you familiar with my blog, it is no surprise to see me at work with doughs, I am a self-confessed bread addict. 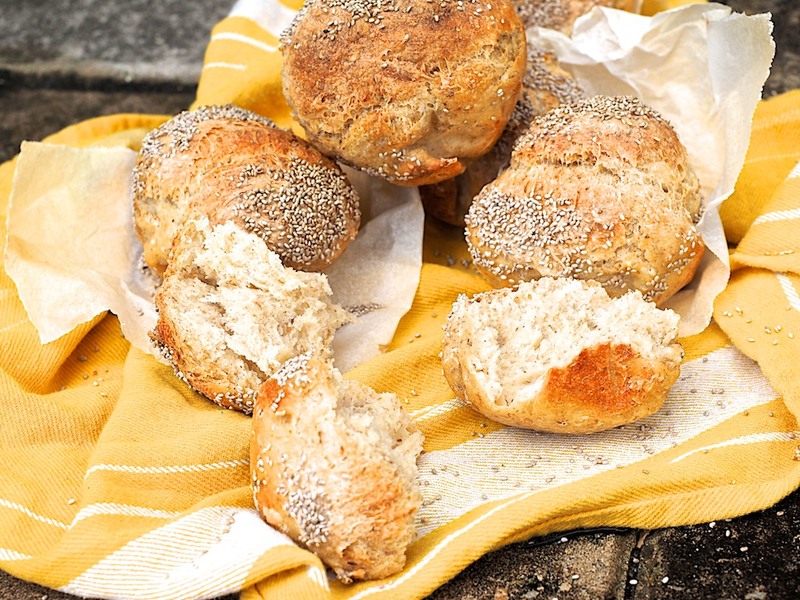 If you are new to this space…well I hope you love your carbs too! These are good carbs, by the way. The dough, which requires no kneading as such, is fermented for a very long time and risen overnight, creating an easy to digest bread. 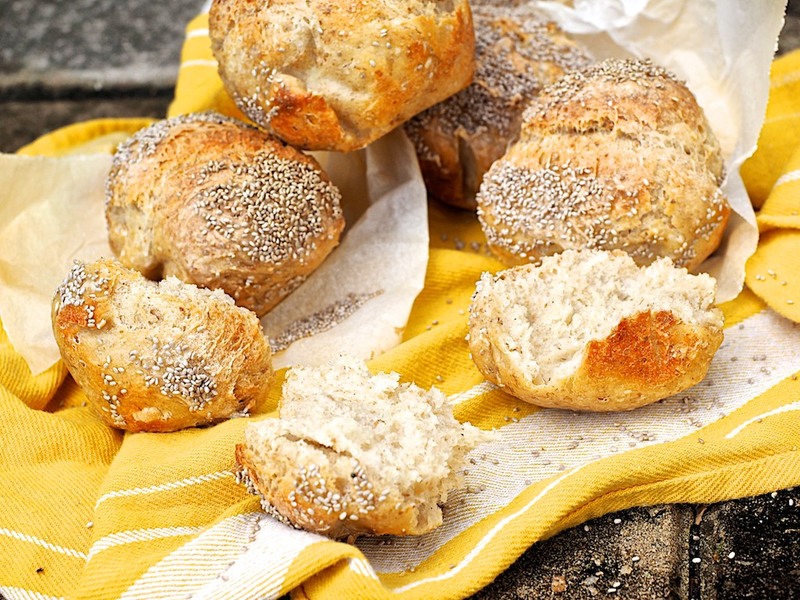 The addition of super healthy chia seeds turns these delicious rolls into a palatable proposition to even my most resolute “I don’t eat carbs” friends. More importantly, my young children devour them with such gusto, I can barely contain my grin! 1. Mix flours, water and yeast together with a wooden spoon until combined. 2. Add salt and mix again. Your mixture will look and feel quite sticky. Cover the bowl with cling wrap and let it prove for 10/14 hours, or until it’s grown three times bigger and looks bubbly. The dough should feel quite wet, almost like a thick batter. 3. 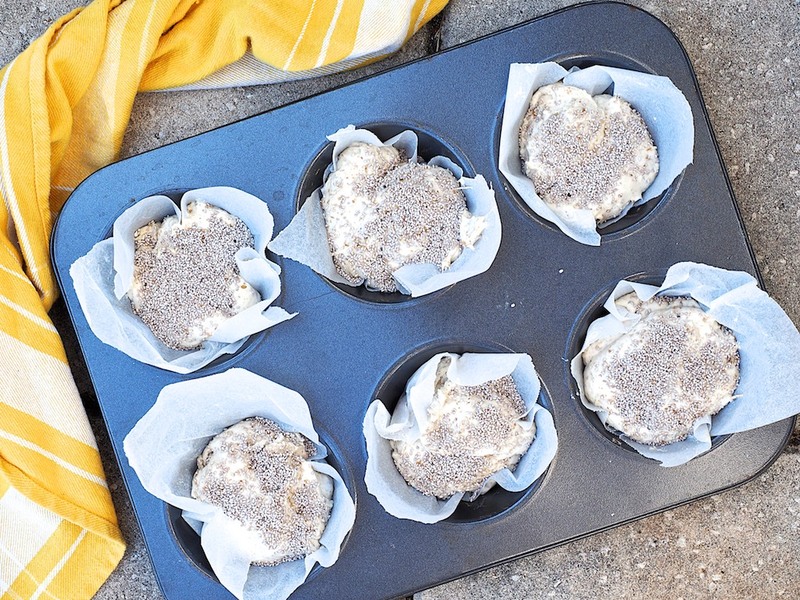 Line a muffin tin with baking paper to fit each hole. Spoon 2-3 tablespoons of mixture onto each hole. Top with chia seeds and allow to rise for 1 hour. 5. Place the tin in the oven, bake for 10 minutes then reduce the temperature to 200 C (395 F) and bake for a further 10-15 minutes or until the rolls are golden and well risen. Remove the baking paper and allow to cool on a wire rack. They are best eaten 1 hour after baking. These look fabulous Silvia! And healthy sounds even better. Baking bread is such a feeling of satisfaction…maybe because it’s like a science experiment with a huge transformation at the end. Ciaa Silvia-come stai? I have not visited in a awhile. I have taken some time off from blogging – a car accident, surgery and now a home remodeling project! And I have only just come back into “circulation.” I hope all is well with you. These rolls look wonderful. I adore bread, and I love finding new recipes. Un abbracio a te! Oh Adri, are you ok now?? Hi Silvia. I met you at the Melbourne Food and Wine Show and we talked about making pizzas in our outdoor pizza oven. I did not write down the recipes for the pizza you made at the Show – can I use this recipe with modifications (spread the dough after it has risen rather than putting it into muffin tins) or use it as is? Thanks for your time. 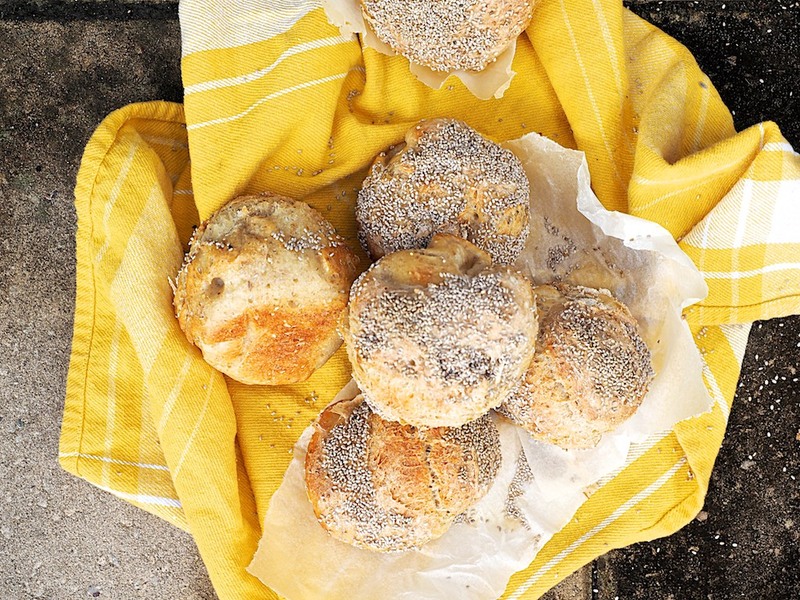 I want to make the Chia seed bread rolls, Does the dough need to go in the fridge for the 14 hours? Can I use spelt in place of the rye?